Firemen battle with the elements – fire, water, earthquakes. Major Josef Křen (41) led a rescue operation in Algeria, where an earthquake recently claimed about 2,000 lives. He told The Prague Tribune how such an action is coordinated. 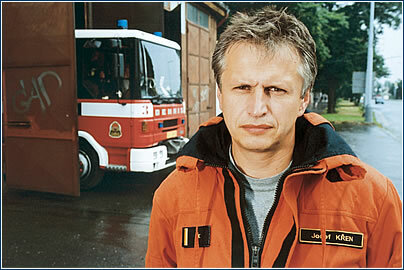 You are in command of the fire brigade at Prague’s Station No. 3 in Holešovice. However, the public became aware of you as the commander of the so-called SAR team that was active following the earthquake that struck Algeria this May. What is an SAR team, and how does it function? 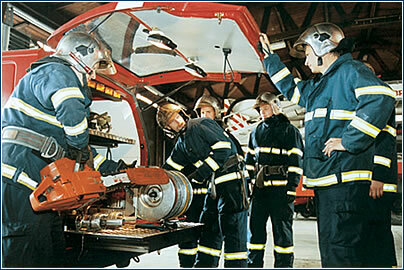 The SAR (search and rescue) team was created on the initiative of the Czech Republic Fire Rescue Troop. It comprises about 90 people from the entire Fire Department of Capital City Prague, broken down into three groups. Only the most experienced are chosen from a total of about 700 fire fighters. This team goes into action in large events that require special procedures, both in the Czech Republic and abroad. The mission to Algeria, which was hit by an earthquake measuring about 6.5 on the Richter scale, included nine of our firemen, one physician, and three dog handlers. Our assignment was to search the ruins for the injured and the dead. During the rescue operation you faced many stressful situations, from tremendous heat to turmoil. How did you manage to keep up the pace of work and discipline in such a situation? The people who were selected for the team saw it as a great honor. They are rescuers who don’t snivel, because they’re used to physical stress, and they really want to work. They came up with ideas for resolving situations that arose on their own initiative – they didn’t just wait for my orders. I don’t like to force anyone to work, and a person who needed that wouldn’t last long on the team. This work is action-filled, and each time you face a unique situation that requires quick and precise decisions. In Algeria I didn’t have any problems with my people, but rather with local citizens who were very emotional and got in our way. Furthermore, local rescuers, who were supposed to help us maintain order, also behaved with little discipline. How did you resolve such situations? Radical measures were required. I told the local commander that they were hindering more than helping us, and that if the citizens didn’t get out of our way we’d pack up and go work somewhere else. It was us or them. The situation calmed somewhat then, and in the end we even worked together with them. You don’t work on a regular basis with all the members of the SAR team. How did you earn the respect of people under your command? Although my position was as a commander, I wouldn’t use the word “command”. Instead, I coordinated them. I believed in them, and I hoped that in return they would understand that my decisions were the best solutions at the given moment. But I’m no authoritarian despot who would force them to do things they didn’t think were right. For example, the dog handlers came back after a few hours spent in the ruins, saying the dogs had had enough and needed a break. I accepted their decision, and I didn’t force them back to keep pace with the rescuers, who worked 12 to 14 hours a day with only a single break. Over 2,000 died in the Algerian earthquake. Your team was working in the Bord-Menaiel area, where you found five corpses but no one alive. What does it do to the team’s psychology when its members aren’t able to accomplish the mission, that is, to save lives? I wouldn’t put it that way. We fulfilled our mission goal, even though it didn’t culminate with locating survivors. It’s often a question of luck. Although we pointed out to the local commander that our team specializes in rescuing survivors, they assigned us to an area that the dogs had marked as a site with only dead victims. We were working at full tilt to find living bodies. Unfortunately, that didn’t happen, and our score was five corpses and no survivors. Our feelings of disappointment were soon over-ridden by our awareness that there wasn’t anything more we could do. No survivors were found in the town we were working in up until the time we left. After your return from Algeria you became a media star. How did your colleagues feel about this? I understand why the media writes about such things. It’s advertising for our country, both here and abroad, but people feel that a certain injustice is involved. Most of the appreciation goes to the commander who gives the interviews. But without a team a leader would be nothing. For example, during the floods last year, thousands of anonymous rescuers worked in forty-eight-hour shifts, they had to constantly improvise and withstand far more than we did in Algeria. Even though I see Algeria as a sort of career milestone, I hope the importance that the media attached to my person had no effect on my relations with my subordinates. I get together with my colleagues when we’re off duty. We go on bicycle trips, and we hike together in the mountains. We also invite firemen from other stations and their families, to get to know one another better. What is your idea of an ideal commander? He should be decisive, but not despotic. He should be well informed, but he shouldn’t think he knows everything. What are you lacking to live up to your ideal? Maybe I should be more consistent. I’m rather liberal, and sometimes I let people get away with too much. Then I try to retreat to the limits I’ve set. Also, I can be a bit capricious. But it’s hard to evaluate yourself.